From here to Eternity felt like perfect travel reading for a trip to Helsinki in March to attend a memorial service. 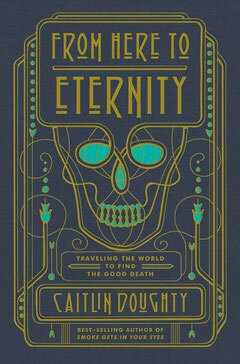 The author, Caitlin Doughty, is a mortician who runs a non-profit (!) funeral home called Undertaking in L.A., and she has written a witty and thought-provoking book about funerary customs around the world and through history. What she describes here is not even remotely like the customs I have experienced in the USA, Germany, or Finland. She has traveled to Indonesia, Belize, Bolivia, Mexico, Japan, and Spain to see how other cultures take care of their dead. And maybe those are the key words here. We don’t take care of our dead. As soon as somebody dies, they are handed over to a funeral home, i.e. a company, because we wouldn’t know what to do anyway. We haven’t learned anything about this. Contrast this with the place in Indonesia which she visited, where the dead are kept in their families‘ homes for the period of time between their death and the funeral. (This can range from several months to several years!) There are descriptions of an open-air pyre in Colorado, a facility in North Carolina which is experimenting with turning bodies into compost, an un-embalmed natural burial in California (I’ve often wondered why all burials aren’t like that, it seems much more natural), a hypermodern funeral home in Barcelona, a high-tech columbarium (building which stores cremated remains) in Japan, and ñatitas (human skulls or mummified heads) in La Paz, Bolivia which are revered and thought to be able to grant certain favors. Despite the subject matter, From Here to Eternity is anything but a somber and morbid read. It’s written with a healthy and lively dose of dark humor and I hope it gets translated into many languages! After all, it’s a subject that affects each and every one of us sooner or later, and of course reading it makes you think about your own mortality and how you want to be ‚interred‘ when the time comes.